T-Mobile fans have been long waiting for a new flagship smartphone. The carrier began offering the Galaxy S II last year and, since then, has offered very few flagship devices. In fact, it chose to launch the HTC One S instead of HTC's higher-end One X. Wait no more — your smartphone has arrived. We've been testing T-Mobile's Galaxy S III for the past several days and, while it doesn't offer support for AT&T's faster 4G LTE network, it supports T-Mobile's 42 Mbps HSPA+ network. This should definitely be your next phone if you're a T-Mobile subscriber. I'll go over exactly why in my review that follows below. Editor's Note: Many parts of this review were taken from our review of the Samsung Galaxy S III on AT&T (and vice versa) since the two phones are nearly identical save for the color and the internal radios. The main differences in the two reviews can be found under battery life, call quality/data and in the conclusions. Samsung says the Galaxy S III is inspired by nature. I guess I'm not quite sure what that means but its rounded edges make the phone feel absolutely comfortable and natural in my hand, even with its large display. My T-Mobile review unit is "pebble blue" and it's slightly different than the color scheme we saw on international models. The hue is a bit more gunmetal blue and doesn't have as much texture in the paint. It looks amazing in the sunlight though and has a mirror-like reflection. I love the color and prefer it over the pebble white model I tested on AT&T. The phone's back is beautifully contoured and accented on the sides with a metal-colored streak that, combined with the phone's slight heft, makes it look and feel like a high-end smartphone. The Galaxy S II, by comparison, felt a bit cheap. On the contrary, the back cover is still a bit flimsy when it's removed from the phone, but that's one bonus that the Galaxy S III has over the One X: you can remove the back cover to add memory via a microSD card slot or replace the battery on the fly. There's also a microSIM slot under the cover. The front of the phone is dominated by a huge and ravishing HD Super AMOLED display with a 1280 x 720 pixel resolution. It is nothing short of a pleasure to look at; the colors are vibrant and text is super sharp. My only gripe is that it can be a bit hard to see under direct sunlight. The entire phone measures 5.38-inches x 2.78-inches x 0.34-inches which may seem a bit big to those used to smaller handsets such as the iPhone, but it definitely didn't feel too big to me. There's a 1.9-megapixel front-facing camera on the top-right face of the phone for video chat and for the phone's eye-tracking feature, which I'll go into later. Samsung didn't tweak the industrial design from the original international model, which means there's also a hardware home button and two capacitive touch buttons for home and menu. Those two buttons are invisible unless the phone is on, as is the alert LED that softly glows in the top left corner when you have an alert. The back of the Galaxy S III is home to an 8-megapixel camera with LED flash and a speaker. There's also a microUSB charging port on the bottom of the device and a 3.5mm headphone jack up top. The power button sits in easy reach on the right side of the phone and the volume controls are just as easy to tap, but I wish Samsung also added a camera quick-launch button. Thankfully, there's a software feature for quickly launching the camera instead. The Galaxy S III runs Android 4.0.4 with Samsung's custom TouchWiz user interface. I know most of you already know a great deal about Android 4.0 Ice Cream Sandwich so I'll stick to what's different. I used to like TouchWiz a lot, then I gravitated towards preferring Sense and stock Android Ice Cream Sandwich, but now I'm back to digging TouchWiz all over again. Samsung added a host of features that make it enjoyable. For one, you can watch a video at any time on any screen in a small window. Another great feature — you can customize the lock screen with the weather, four different apps and even a news ticker. To its credit, HTC's Sense UI also offers a ton of custom homescreens and I prefer its weather option to Samsung's offering. The homescreen is a bit ugly; Samsung's widgets aren't particularly attractive and the folders look like Gingerbread folders instead of the new circular ones in ICS. Thankfully, there are third-party applications such as Apex Launcher that can fix that. There was a bit more bloatware on T-Mobile's Galaxy S III than AT&T's model. I love that it comes with Flipboard pre-installed, however, and it's a product that's only currently available to Galaxy S III owners and beta testers. It's great for viewing the news and the app's widgets are beautiful. My device also came with T-Mobile Mobile Hotspot, T-Mobile Name ID, T-Mobile TV, Visual Voicemail, Access T-Mobile, Kies Air, Media Hub, S Suggest, S Memo, S Voice, AllShare Play pre-installed, all of which will be useful to at least a few users. There are small niceties tucked throughout the operating system. When you open the video gallery, for instance, each of the videos begins playing in a small loop so you can see each movie or clip without having to open and close each one. It's both useful and awesome looking. Additionally, the phone occasionally activates the front camera to check if you're still looking at the screen or not. If you are, it will leave the screen on. If you're not, it will turn it off. There's a neat little eyeball indicator at the top of the display when this feature is active, but it only lasts for a split second. There are several other software features that Samsung has added to the camera and photo gallery applications, and I'll cover those in the camera section. For now, let's move on to Samsung's Siri competitor, which is called S Voice. S Voice is Samsung's voice assistant that is clearly a copy of Apple's Siri software. It doesn't work that well, but it's good at performing a few tasks. Just like with Siri, you can ask S Voice whether or not you'll need an umbrella and it will provide the weather. It worked well for quickly adding notes to the S Memo application. You can also ask it to send a text message to anyone in your address book and it will scan, pull up the numbers for that person and ask which one to use. I found that it wasn't very good at understanding the content for my text messages, however. It was able to understand me when I said "what do you wanna do for dinner" but provided an "unexpected error" when I asked it to text my brother and ask him if he "caught the score of the basketball game last night?" Like Siri, S Voice pulls in results from Wolfram Alpha. It provided an elevation chart and the exact elevation when I asked how tall Mount Everest is, but it crashed when I asked how tall the Empire State Building is. It can also search for nearby points of interest. When I asked it to "find a sushi restaurant" it quickly returned six nearby restaurants complete with their phone numbers, reviews and the option to search for it on a map. S Voice is also crazy buggy if there's any background noise. I once asked S Voice to "text Ryan" and it asked "which one?" but didn't pop up a menu. So I turned it off and tried again. The next time it just kept looping through the command and search request over and over and didn't provide any answer. Then, about 30 seconds later, it took every one of my responses and tried to execute them all at once. It turned out that my air conditioner that was running in the background was throwing it off. S Voice needs some work, but if you want to quickly check the weather or find a restaurant it'll do the trick… sometimes. Samsung's trying to take NFC mainstream with the Galaxy S III. The company has decided to sell special stickers called "TecTiles." The stickers will be available in T-Mobile stores in packs of five for $14.99. I was able to program each sticker easily using Samsung's TecTiles application. All I had to do was open the app, tap the phone to a TecTile and then choose what I wanted that TecTile to do. Each can be programmed to change a phone's settings, make a call, send a text message, show a contact, check-in on Facebook or FourSquare, post a Tweet, launch the camera or more. I left one on my kitchen wall and tapped it when I came home to automatically activate and connect to my home Wi-Fi network, but I was also thinking about how fun it would be to leave a sticker under the table at one of my favorite restaurants so that I could quickly tap it and check-in each time I visited. I've been pretty bummed with the number of NFC smartphones that can't really use NFC for much other than Android Beam for media sharing, so it's refreshing to see Samsung push it further. Other companies, such as Sony, offer similar solutions. The 8-megapixel camera on the Galaxy S III snaps amazing photos. Most were clear and sharp, even when viewed back on my TV or my television set using an HDMI adapter. I love Samsung's camera options, too. You can tap and hold icons to drag and organize the different features within the camera app to suit your liking. So, if you want the "effects" feature on the main camera screen, you can replace the auto-focus or any other option with it. There are tons of shooting modes, too, including burst shot that snaps 20 photos in rapid succession with zero shutter lag as you hold down the camera's shutter button. There's also a "best shot" option that allows the camera to automatically decide which shot is best. Both features are available on HTC's One X and perform just as well. An HDR option takes several photos and grabs the most colorful of those options and combines them into one single photo. The phone's 1080p video capture was also top-notch. I captured a few clips outside of my apartment and then played them back on my TV and each was clear and wasn't too pixelated. Samsung even added an option to lock the auto-focus feature while you're recording so that you can keep one object in focus. My favorite feature is the Photo Buddy Sharing option, which allows you to link up several Galaxy S III devices and have every photo saved to each phone. It's amazing for sporting events or parties. My fiance and I walked around the city (she used the T-Mobile variant) and snapped several photos each — all of them were available on each of our devices. Finally, there's a face tagging feature that worked quite well. It can automatically detect who-is-who in each photo you snap and labels them with their name. If you tap a face, it even suggests a list of names of who it thinks the person in the photo is. This feature does get a bit annoying when the name tags cover the faces of the people in the photo, however, so I left it off most of the time. Call quality on T-Mobile's network was really good. I didn't have any dropped calls with the phone and callers were able to hear me just fine. As was the case with AT&T's model, background noise was an issue at times, especially while walking outside around NYC traffic. The speakerphone was plenty loud and my colleagues could hear me just fine during a test on a team conference call. T-Mobile's Galaxy S III doesn't support 4G LTE networks as Sprint, AT&T and Verizon's models do. Instead, it runs on T-Mobile's 42Mbps HSPA+ network. That's plenty fast in some areas, where I saw speeds around 8-11Mbps. Still, in my apartment I rarely saw those speeds exceed 1Mbps and uploads typically hovered around 1Mbps here, too. The Galaxy S III offers excellent battery life. I was able to make it until late in the evening with the Galaxy S III and while using the phone regularly throughout the day to place calls, receive e-mail, surf the web and to listen to music. I typically despise the battery life of newer phones but was pleasantly surprised that the Galaxy S III was able to last as long as it did. Overall, it's one of the longer lasting smartphones on the market today. 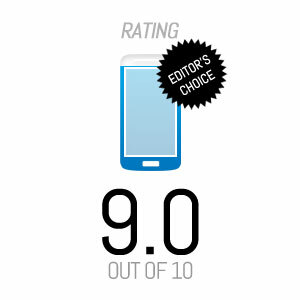 If you're already on T-Mobile and want to stick with the network, then the Galaxy S III should be at the top of your list. It's the best phone T-Mobile USA offers and it's a true gem any user should be happy to carry. You might want to consider Verizon or AT&T for access to faster 4G LTE networks, since T-Mobile's 42Mbps network isn't incredibly expansive. Still, if you're happy with T-Mobile, then the Galaxy S III is a no brainer.